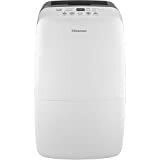 Hisense - DH-50KP1SDLE : Dehumidifier Review • The Air Geeks, reviews of air conditioners, dehumidifiers and air purifiers. Although Hisense is not on the podium of the best brands of dehumidifiers, the Chinese multinational manufactures, with the DH-50KP1SDLE, one of the best 50-pint dehumifiers. The DH-50KP1SDLE is a strong dehumidifier that is capable of pulling up to 50 pints of moisture from the air per day. This unit is suitable for large spaces and features a built-in pump that enables it to pump the captured water to a sink. If you want to lower the humidity level of your room and you are looking for a suitable dehumidifier, then you should consider this unit. What does this unit offer? This dehumidifier offers impressive features that could make it a suitable choice for your dehumidification needs. We have gathered all the information that you need to know about it. Whether you are looking for its features, strengths, or drawbacks, we have it all tested! Let us dive in with further ado. The DH-50KP1SDLE is a 50-pint dehumidifier that draws a lot of water from the air within a short a time. This unit can be employed in spaces that are as large as 3000 square feet. It lowers the relative humidity to the set level thereby making your house or office unsuitable for mold and mildew. Excess moisture causes mustiness. It can also destroy your decorations, furniture, and other household possessions. If you want to transform the environment of your room and you are looking for a strong dehumidifier, then you should consider this unit. A built-in pump is what makes this unit to stand out from most dehumidifiers. With this feature, the DH-50KP1SDLE can pump the captured water to a sink that is up to 8 feet above it. This design makes this dehumidifier a suitable choice for use in basements. The DH-50KP1SDLE offers an intuitive control panel that allows a user to adjust settings with ease. In addition to ordinary features, this electronic control panel offers the pump function. Furthermore, the DH-50KP1SDLE offers the following three modes: manual set, auto dry, and continuous. This allows you to choose the setting that is most suitable for your needs. Sometimes the user may need to move the unit from one position to another for best results. The DH-50KP1SDLE features caster wheels and handles that enable a user to move it with ease. Furthermore, this dehumidifier is an Energy Star rated product and it is therefore designed to consumes minimum energy. Despite this, we have observed a contradictory characteristic. This unit produces a lot of heat and can therefore cause a significant temperature rise especially when it is used in a small room for a long period of time. Although this unit seems to offer many impressive features than most dehumidifiers in the market today, we have noted that the number of reported failures is high. Many cases of compressor and pump failures have been reported for units that have been in use for less than one year. Considering such cases, the lifetime of this unit could be short. Powerful and highly effective. This dehumidifier brings the humidity to the desired level within a short time. With this unit in your room, you will never complain about mustiness. Quiet operation. Although this unit produces sound, it is quieter than most units of same or lower capacities. Built-in pump. This feature allows the unit to pump the captured water to a sink without relying on gravity. Inaccurate humidity sensor. We have observed that this unit hardly goes off even when the desired relative humidity is achieved. As a result, the system rapidly switches between on and off when the desired level is achieved. No tank level indicator. The unit does not allow easy monitoring of the water level. You have to remove the tank to check the water level. I have only used small dehumidifiers before, for closet or storage space. This winter I have had a lot of condensation on windows, and have been concerned about mold. I ordered this unit because of the capacity and built in pump. I put it in my laundry room where the furnace fan circulates house air, and I can feed the drain tube into the water heater overflow pan, draining to the outside. I set it on Automatic (will bring down to 50% then shut off). The level began at 78%, and now it maintains in the low 50's. It is not too quiet with the compressor and fan (although no worse than a box fan in summer), but it is in a closed area and not an issue. All condensation is gone and the house feels more comfortable. Really happy with this purchase." Purchased this item because I get an amazing amount of condensation on my windows during the fall and winter months. I was impressed with how it works so far. I have a master suite that consists of the bedroom, walk in closet and bathroom. There are 14 windows and so far not a sign of condensation. Prior to purchasing this I had to wipe down water and sometimes remove puddles of water from my windows. This will most certainly protect my wood casement windows from water damage. And it is a lot cheaper than having custom interior storm windows built." The DH-50KP1SDLE is a strong and quiet dehumidifier that features a built-in pump. Its impressive dehumidification capacity makes it a suitable option for large living rooms, bedrooms, and offices. In addition, it does not produce disturbing noises and can therefore be used in places that are expected to be quiet. Although our research reveals that this unit performs quite impressively, we have noted that the placement of its humidity sensor causes inaccuracies in humidity readings. This causes the unit to go on and off when the desired humidity level is achieved. Despite this drawback, this dehumidifier scores highly and we therefore cannot hesitate to recommend it. This unit certainly delivers more than what one would expect. If this unit meets the specifications that you are looking for, you can get it at a price of $230. Certainly deserves the Air Geeks’ seal of approval!